If required, create a Filter here. The "Only prevent duplicate assignment" setting can only be selected if a plugin performs conflict resolution with itself. A filter is then defined internally that finds a conflict when a resource is already booked at a specific time. If the setting is selected, no static filter may be specified at the same time. Deactivate this option if you want to define your own filter. If a sign (+ or -) is specified, the corresponding time frame will be added or subtracted. If integers without a sign are entered, the time portion is replaced. 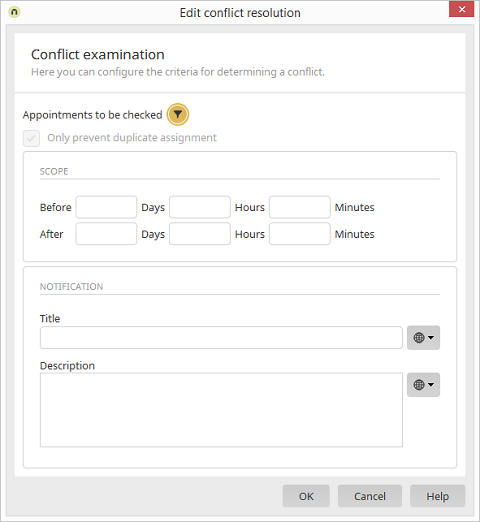 If a conflict is detected, the user will be notified of this when saving the data record. Provide the conflict resolution with a title. Click here for more information about defining titles. As with the title, the description can be specified either statically or dynamically from a constant.